About five years back it was suggested by quite a few on this forum that a large scale, G-scale Strasburg set would be a great idea. At that time, BachmannMan mentioned he'd approach the company with the idea yet there's been no followup mention to that thread for about five years. Surely the decision makers at B Industries must have had the idea of a large scale Strasburg RR set run by them. since then So, Mr. B Man, how about it, is there a chance they might reconsider the feasibility of making a Strasburg set? After, with O-gauge Lionel has done quite well with its Strasburg set and varioux add-on cars. MTH, too has made Strasburg locomotives and cars in O-gauge (and even standard tinplate) which have proven to be 3-rail favorites and good sellers. There are those model railroaders who even run them in O-gauge garden layouts. If B Industries would do customer research or a simple survey in Garden Railway magazine they'd find many RR enthusiasts would seriously consider purchasing a large G-scale scale Strasburg RR set if one were available. So how about it B Man? Please convince the powers who be at B Industries not to miss the boat (er, train) and see some other manufacturer gobble up the profits making a large G-scale Strasburg Railroad set. 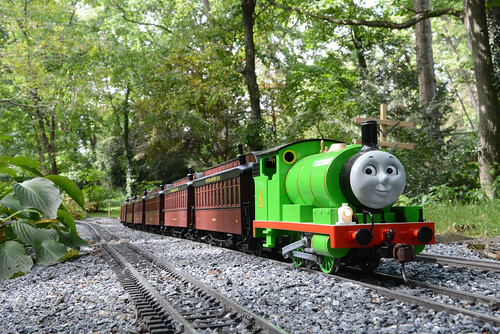 Theoretically - you could have a cross over offering- SRC Coaches and Thomas/Percy. For a 4-6-0, there are a variety of choices for locomotive number: 972 (George Hart's 4-6-0), 475 (which has similar lines as the big hauler 4-6-0), or even LIRR 39, which could also be used to cross promote that restoration project.